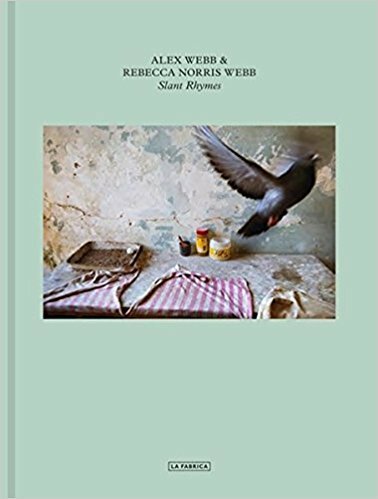 Slant Rhymes is a photographic conversation between two world renowned authors, Magnum photographer Alex Webb and poet and photographer Rebecca Norris Webb. Selected from photographs taken during the Webbs’ nearly 30-year friendship and later marriage and creative partnership, this group of 80 photographs are paired—one by Alex, one by Rebecca—to create a series of visual rhymes that talk to one another, often at a slant and in intriguing and revealing ways. “Sometimes we find our photographic slant rhymes share a similar palette or tone or geometry”, writes Alex Webb in the introduction to the book. “Other times, our paired photographs strike a similar note—often a penchant for surreal or surprising or enigmatic moments—although often in two different keys.” These photographs, most of which are published here for the first time, are interwoven with short text pieces by Rebecca Norris Webb. The result is an unfinished love poem, told at a slant.